When New55 released a monobath a few years ago, I was eager to give it a try. What could be easier? A single solution to develop black and white film and no need to mix chemistry. After successfully developing a few rolls of 120 film, I was happy. That changed when I tried to develop 35mm film. I found that each roll had bromide drag. What is bromide drag? It occurs when the silver bromide overpowers the developer, leaving marks from the edges of the film sprockets, bleeding into the center of the film. When doing some research online, I found no real consensus. One person stated the temperature of the monobath needed to be exactly the right temperature, another said that agitation needed to happen at certain points in developing, and another person said that a prewash on the film was necessary. Heat the monobath and some distilled water to 75° F with the FPP Heater Helper. Prewash the film for 1 minute with distilled water, dump distilled water. Pour in the monobath and agitate (invert) for the first 30 seconds, and then 5 seconds every minute. Pour monobath back in bottle. It can be used for about 3 – 6 months. Rinse film with FPP Archival Wash for 1-minute. Saves 10 – 20 minutes of wasting water. Pour archival wash back in bottle. Add diluted Kodak Photo-Flo for 1-minute, dump when finished. It’s odorless. When I was using the New55 monobath, I had to open the window because it smelled like household cleaning ammonia. The FPP monobath has no smell. It’s quick and easy to use. There is no need to dilute or mix chemicals. In just a few short steps, your negatives are developed. It doesn’t work the same with all black and white films. Kodak TMax needs longer developing times. And films over ISO 400 are not recommended. Doesn’t give you the same flexibility as conventional developing, i.e. pushing and pulling. Increasing temperature can give you a small boost in density. Would I recommend trying a monobath? Yes. It’s a guaranteed gateway drug for developing film. For me, using a monobath gave me the confidence to move to more conventional developing. Mixing, diluting, and using multiple chemicals can be intimidating if you’ve never done it before. A monobath is a great starting point for anyone that wants to develop easy, quickly on a small budget. 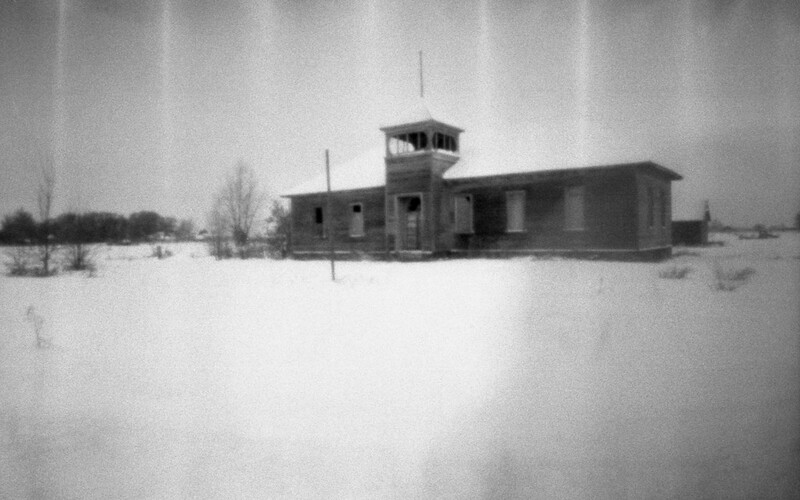 In the past, I’ve tinkered with pinhole cameras. Nothing too serious. My first attempt at pinhole was the Viddy cardboard pinhole camera . Then there was the pinhole lens cap for a Pentax Sportmatic. Next, there was my semi-successful attempt at making the Tie Fighter pinhole camera. Last year my wife asked me what I wanted for Christmas. I told her I wanted a nice wooden pinhole camera. Her response, “Go buy it yourself.” So, I did. I found a local film photographer that sold me his Ondu 135 Pocket Pinhole camera. Ondu’s success goes back to a Kickstarter in 2013. Elvis Halilović, a Slovenian industrial designer and carpenter, created six different types of pinhole cameras. At the end of 30-days, the Kickstarter was a success. Elvis manufactured and delivered cameras to pinhole enthusiasts around the world. The smallest and cheapest of these was the Ondu 135 Pocket Pinhole. Handcrafted in Slovenia, the Ondu 135 is made of chestnut and maple wood. The back of the camera and advance/rewind spools on the top are held in place by magnets. The pinhole size is 0.20mm, a focal length of 25mm, giving you an 81° field of view and an aperture of f/125. The camera has a standard tripod mount on the bottom. To trigger the shutter, you simply slide the horizontal wood piece on the front of the camera up, uncovering the pinhole, allowing light to enter the camera to expose the film. Since the initial launch in 2013, Ondu has continued to craft updated designs. Newer versions of the Ondu 135 Pocket Pinhole include a bubble level, shutter stop, and engraved lines on the camera making it easier to compose an image. Before I continue with the pros and cons, keep in mind that my Ondu 135 Pocket Pinhole is first model. This version lacks a few features that newer models have. The camera doesn’t have a bubble level, but that’s okay because my tripod has one. This version doesn’t have the horizontal and vertical viewing engravings. I may need to make some markings on my camera so I can compose a better shot. The takeup winding knob lacks any kind of information on which way to wind the knob, or how far to wind the knob. Newer models have an engraving indicating which way to wind the knob. I’ve made some marks on my camera to remind me. While there is a strong magnet behind the shutter, there is no shutter pin on this model, making it easy to accidently move the shutter up or down. The Ondu 135 Pocket Pinhole weighs 220g, making it a small but sturdy pinhole camera. The camera comes with an empty take-up cartridge. As you advance the film, it’s rolled into an empty 35mm cassette, making accidentally exposing an entire roll of film impossible. The camera is very easy to load. Even in the cold weather, I was able to quickly load a new roll of film. It’s a good looking camera. The wood finish feels good in your hands and looks good. Overall the Ondu 135 Pocket Pinhole is a fun camera to use. The quality and craftsmanship of having a wooden pinhole is a nice change to cardboard pinhole cameras. Over the coming weeks, I’ll be sharing some additional photos taken with the Ondu. Being that I’m no pinhole expert, many of my shots were poorly exposed or composed. I’ve experimented with three different film stocks and used a simple development method. And though my images are far from the awesome pinhole photos found in The Lensless Podcast group on Facebook, I enjoy this camera so much, it’s worth the time and patience to learn more about pinhole photography. One final roll from the the Canon 10S. This time using one of my favorite black and white film film stocks, Kosmo Foto Mono 100. Last May, Scott Smith was at the Utah Film Photography Worldwide Headquarters (my house) to develop some 4×5 sheets he’d shot with his newly acquired Graflex. We used a tank that would hold ten sheets and required over a half gallon of chemistry. I’m not doing that again. I’ll stick with 4 sheets in the Stearman Press SP445. Anyway, I digress. Scott showed me a Canon EOS 10S that he had purchased earlier that day. Both Scott and I have owned Canon digital gear over that past decade. He has sold most of his Canon gear but kept a Canon 24-105mm f/4 IS USM L-Series lens. Because the EF lens mounts were the same, he paired this lens with the 10S. While Scott developed film, I played with the camera. Autofocus and image stabilization worked as quickly as it would on my Canon 6D and I was impressed. The next day, I went hunting on eBay and bought a mint Canon 10S for $10, including shipping. In the last six months, the 10S has become one of my favorite cameras, and the closest I want my film and digital worlds to get to another. Introduced in March 1990 by Canon, the 10S (10QD in Japan, 10 in Europe) is an autofocus 35mm SLR camera. The camera features a Multi-BASIS AF sensor. This sensor gives the photographer three autofocus viewpoints. 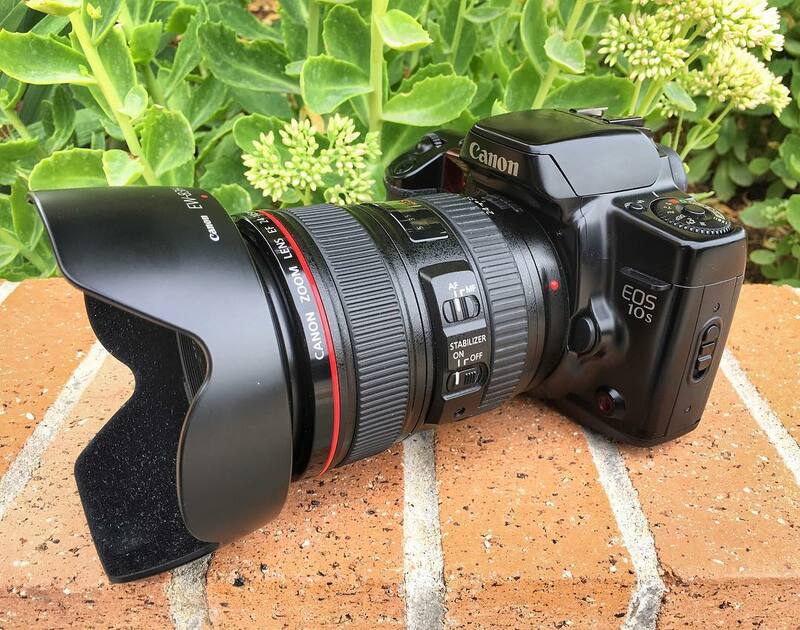 Many of the design elements and features of the 10S still remain on Canon’s DSLR cameras. For example, the command dial is nearly the same: automatic and creative modes, P Program, TV Shutter Priority, AV Aperture Priority, M Manual. The LCD on the top displays your selection of focus modes like one shot, AI Servo, AI Focus. Shutter speeds are 30 sec to 1/4000th sec, bulb and flash sync up to 1/125th sec. Film speeds can range from ISO 6 to 6400. With the meter and exposure controls, the camera has 15 custom functions from autobracketing to multiple exposure. The automatic advance allows you to shoot 5 fps in One-Shot Autofocus and Manual modes, or 3 fps in AI Servo mode. One thing I personally like is the camera design. Because I’ve owned 4 different Canon DSLR bodies over that last 11 years, the layout of the buttons and features are all familiar to me. When I want to change the f-stop, I quickly know where to place my finger. While three autofocus points don’t sound like a lot, the simplicity works. It makes the 61 selectable focal points on a Canon 5DMIV DSLR extreme overkill. I enjoy using Canon L-series lenses like the 24-105 f/4 and 70-200 f2.8. One thing I’ve learned over the last 4 years is I don’t like heavy SLR cameras. The 10S only weighs 625 g (1.4 lbs), but when you use a lens like the 70-200 f/2.8, you add another 1490 g (3.28 lbs). The 10S uses a single 6V 2CR5 lithium battery. Even though it’s a common battery, I paid more for the battery than the camera. I’ve shot 4 rolls with this camera and will be posting the results over the next few weeks. Plus, next week I want to cover the most interesting part of the 10S, the Canon SLR Barcode Reader. Yes, think grocery-store-beeping-barcode reader.